The desire to be a pilgrim is deeply rooted in human nature. Since the earliest times, pilgrimages to holy places have been made as acts of devotion, penance or thanksgiving, or to seek blessings or miracles. A pilgrimage is a sacred journey in which God is encountered through the places, people and situations a pilgrim meets. The physical journey coincides with an inner spiritual journey that reflects the concept of life itself as a pilgrimage towards heaven. Taking part in a pilgrimage offers more than just spiritual benefits. It enriches the mind as well as the soul, by seeing how other people live, gaining an appreciation of their cultures and history, experiencing the sights and smells of their markets and bazaars, and sharing in what they eat and drink. And this can occur in the company of people of similar faith and interests, some of whom may remain friends long after the pilgrimage is over. The phenomenon of pilgrimage has a long and respected history not only among Jews, Christians and Muslims, but also among Buddhists, Hindus and followers of many other faiths. A pilgrimage to the Holy Land has long been enshrined in the traditions of the world’s three major monotheistic religions — those who believe in one God. Jews come to visit the tombs of the patriarchs and the Western Wall of the Temple Mount. Christians come to walk in the footsteps of Jesus. Muslims come to worship at the Al-Aqsa Mosque and other holy shrines. For a Christian, a pilgrimage to the Holy Land can be a life-changing and challenging experience — an experience which then makes every Bible reading come alive and have new meaning. St Jerome, who arrived in the Holy Land in AD 385 and spent more than 36 years there as a Bible translator, wrote “we understand Scripture better when we have seen Judea with our own eyes, and discovered what still remains of ancient towns”. From the time of Solomon, more than 900 years before Christ, pilgrimage to the Temple in Jerusalem was a thrice-yearly obligation for Jews. From the time he was 12, Jesus followed this practice with his family (Luke 2:41-42). During the reign of Herod the Great, between 300,000 and 500,000 pilgrims would assemble for the great celebrations of Passover, the Feast of Tabernacles and Pentecost. With the city of Jerusalem bursting at the seams, pilgrims would erect tent cities on the Mount of Olives and other locations. Others would stay in nearby villages such as Bethphage and Bethany. From the early centuries of the Christian Church, prayerful pilgrims made their way to the sacred places where Jesus lived and died and appeared after his Resurrection. Many travelled on foot. Their journeys involved enormous effort and self-sacrifice, and they faced great hardship and perils. Eventually an organised system developed. Clergy planned a route and the places to visit. Hospices were set up along the way. Troops were assigned to protect the pilgrims. 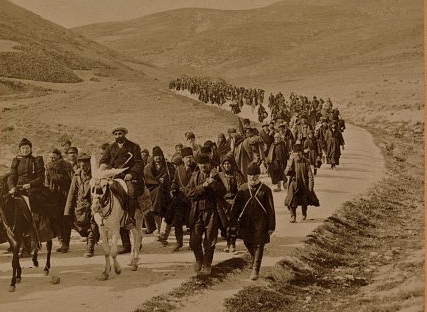 Special laws allowed pilgrims safe passage through areas in the throes of war. Pilgrims even acted as a postal service, carrying letters from place to place. Inevitably, an element of corruption appeared. In some alleged holy places, gullible pilgrims were shown spurious sites and fake relics. St. John Chrysostom (AD c.347-407) noted that many people hurried across the seas to Arabia to see and venerate the dunghill of Job. The Bible was the guidebook for these early Christian pilgrims to the Holy Land. A more specific travel guide, Information for Pilgrims unto the Holy Land, was printed in England by Wynkyn de Worde in 1515 — just 22 years after Columbus returned from the New World. And then I take my pilgrimage. Among Muslims, every adult must undertake the annual pilgrimage to Mecca at least once if he or she can afford it and is physically able. Every year more than two million Muslims do so. The pilgrimage, called the Hajj, emphasises the brotherhood and sisterhood of Muslims and their equality in the eyes of God, regardless of wealth, class or power. Its complex rituals include walking seven times around the Kaaba, a large granite cube covered by a black silk and gold curtain; throwing pebbles at white pillars in three places where Satan is believed to have tempted the Prophet Ismail; and animal sacrifice. Preparation is important if a pilgrim is to obtain the most benefit from a pilgrimage. This is especially so for a group pilgrimage to the Holy Land, since time is usually limited and most of it is committed to a preplanned schedule. To arrive in the correct state of mind, preparation should be not merely on the material level, but even more so on the spiritual level. For the Christian pilgrim, preparation can include reading Scripture passages relating to the sites being visited (references for each holy place are given on this website). Whether the pilgrimage is a once-in-a-lifetime experience or not, the pilgrim should be able to look forward to it as a privileged time in his or her life. Such an experience can be a time of spiritual nourishment, of deepened faith, of soul-searching and discernment, of new resolutions and strengthened commitments — and, yes, of fun, enjoyment and new friendships. Jews, Christians and Muslims are obviously drawn to different pilgrimage sites. But even among modern Christian pilgrims, different groups have their own specific focus. A study by Glenn Bowman, a reader in social anthropology at the University of Kent and a specialist on the anthropology of pilgrimage, found that Orthodox, Catholic and Protestant pilgrimages are quite distinct in their visits to holy places, and which ones they prefer to visit. Orthodox pilgrims concentrate their pilgrimages around holy days. 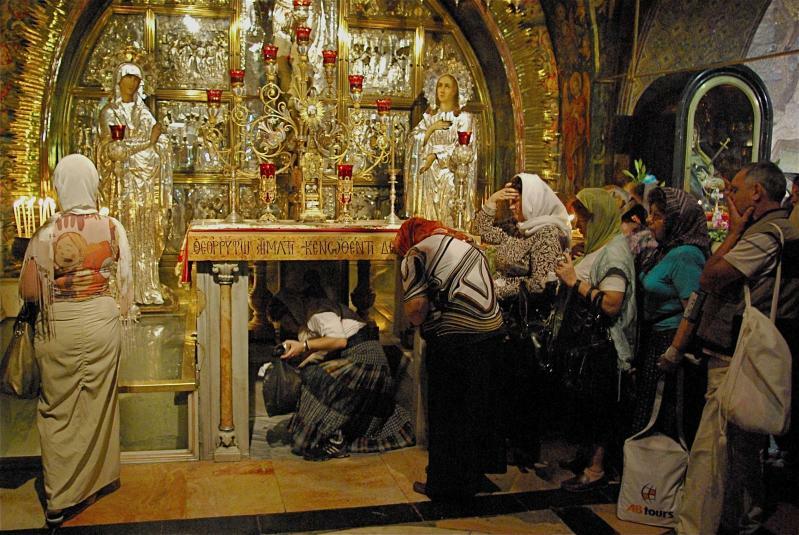 They spend time inside churches, making the rounds of icons to kiss or venerate them. Catholic pilgrims come to renew individual faith. They focus on New Testament sites and reflect on appropriate Scriptures at each place. 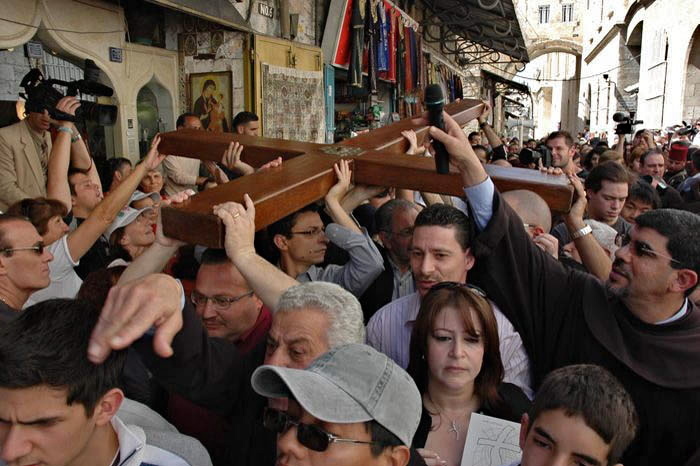 Following the Way of the Cross on the Via Dolorosa in Jerusalem is a typical example. 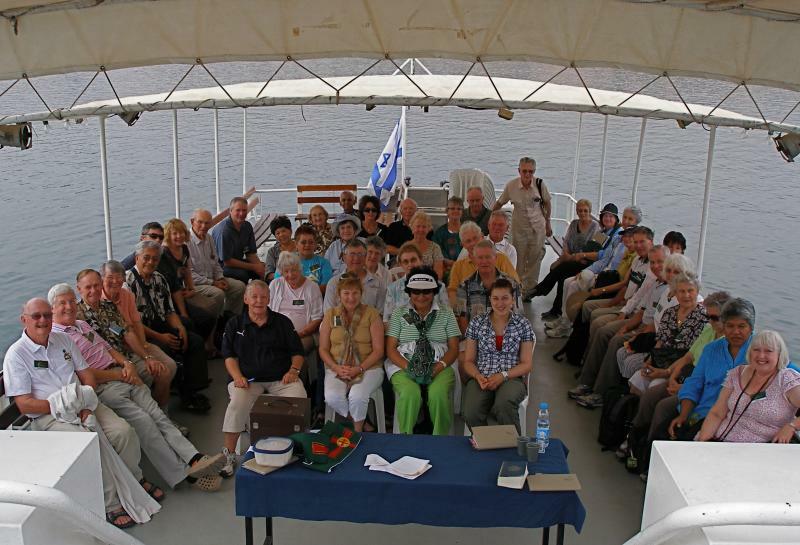 Protestant pilgrims prefer the uncluttered environs of the open country around the Sea of Galilee, or the natural setting of the Garden Tomb in Jerusalem. They tend to be unimpressed by the ancient shrines administered by Orthodox or Catholics — which often offer no worship space for Protestant groups. Among evangelical Protestants, Christian Zionist pilgrims have a focus on supporting the state of Israel, which they see as being in accord with biblical prophecy and leading to the Second Coming of Jesus. PHOTO CREDITS: Where the images on this page are not created by Seetheholyland.net, links to the sources can be found on our Attributions Page.